"Paris!"" 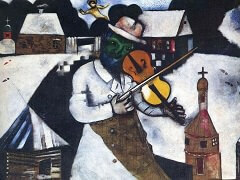 Chagall wrote in his autobiography. "No word sounded sweeter to me!" By 1911, at age 24, he was there, thanks to a stipend of 40 rubles a month from a supportive member of the Duma, Russia's elective assembly, who had taken a liking to the young artist. 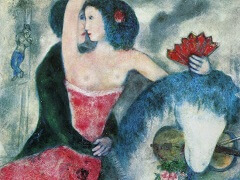 After Marc Chagall moved to Paris from Russia in 1910, his paintings quickly came to reflect the latest avant-garde styles. 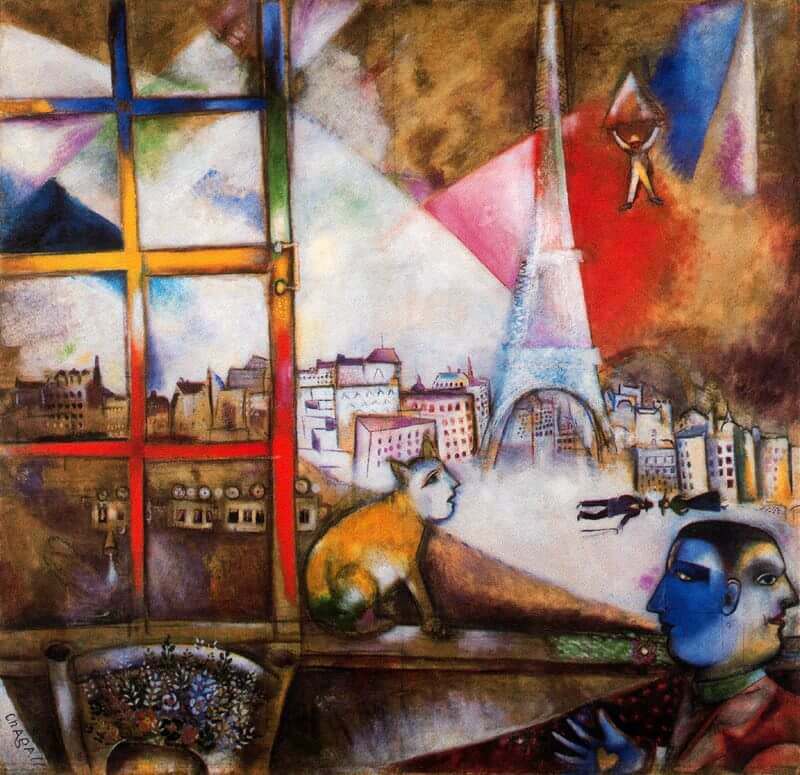 In Paris Through the Window, Chagall's debt to the Orphic Cubism of his colleague Robert Delaunay is clear in the semitransparent overlapping planes of vivid color in the sky above the city. The Eiffel Tower, which appears in the cityscape, was also a frequent subject in Delaunay's work. 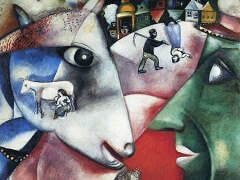 For both artists it served as a metaphor for Paris and perhaps modernity itself. 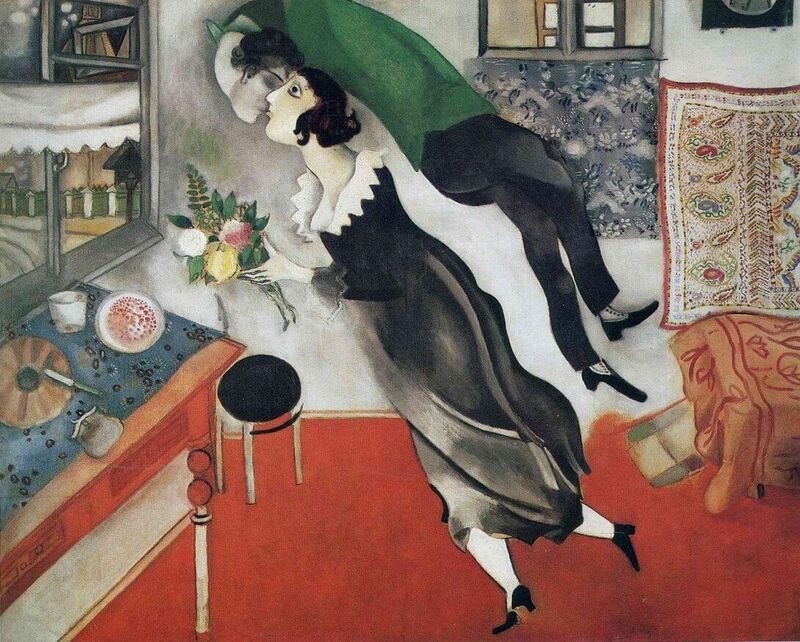 Chagall's parachutist might also refer to contemporary experience, since the first successful jump occurred in 1912. 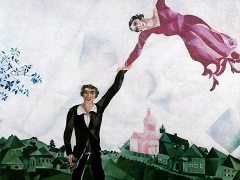 Other motifs suggest the artist's native Vitebsk. This painting is an enlarged version of a window view in a self-portrait painted one year earlier, in which the artist contrasted his birthplace with Paris. The Janus figure in Paris Through the Window has been read as the artist looking at once westward to his new home in France and eastward to Russia. 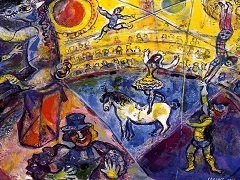 Chagall, however, refused literal interpretations of his paintings, and it is perhaps best to think of them as lyrical evocations, similar to the allusive plastic poetry of the artist's friends Blaise Cendrars (who named this canvas) and Guillaume Apollinaire. 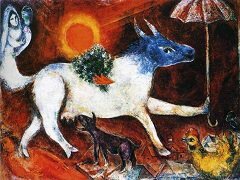 Years after Chagall painted The Soldier Drinks he stated that it developed from his memory of tsarist soldiers who were billeted with families during the 1904-05 Russo-Japanese war. The enlisted man in the picture, with his right thumb pointing out the window and his left index finger pointing to the cup, is similar to the two-faced man in Paris Through the Window in that both figuratively mediate between dual worlds-interior versus exterior space, past and present, the imaginary and the real. In paintings such as these it is clear that the artist preferred the life of the mind, memory, and magical Symbolism over realistic representation.